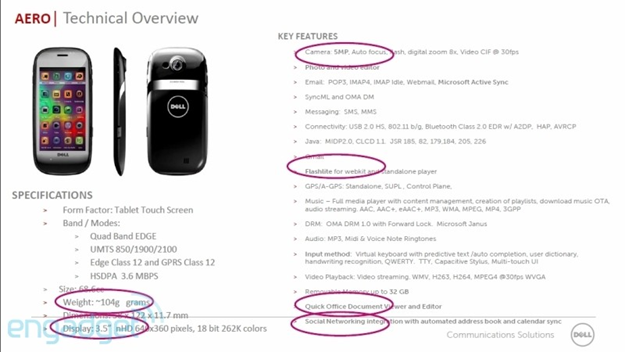 Looks like this is the last set of Android related Dell leaks that Engadget miraculously dug up yesterday. 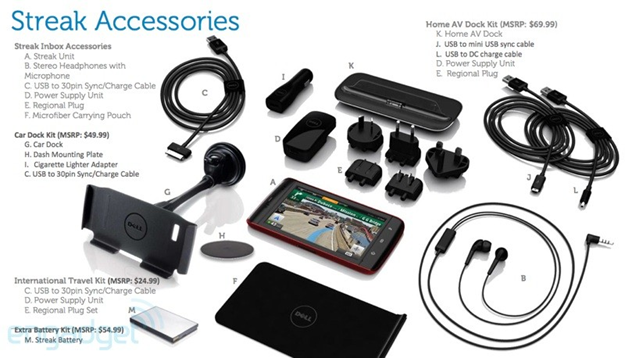 The first leak shines some light on the Dell Aero - Dell's upcoming budget Android phone. 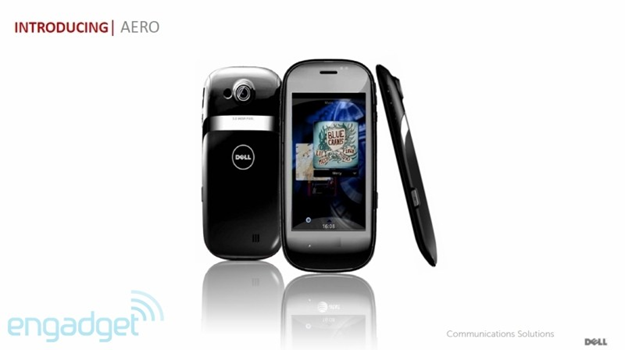 Previously, the only information we had about this phone was the 3.5" screen, a 5MP camera, and a June release date. Because of the budget tag, we were now not surprised to find out that the phone would be running a 624MHz Marvell CPU, which is the same CPU the sometimes laggy Spring Design Alex eReader has inside. It will be running Android 1.5 or 1.6 at launch but a refresh with 2.1 is planned for Q3 or Q4 of this year. 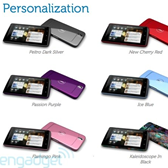 An interesting thing to note here is that both the stylus and touch methods of interaction are mentioned which is unusual for Android touch screen phones. Why Dell thought the stylus will be necessary is beyond me - it is not a tablet device where precise drawing could be important and touch screen navigation is normally preferred to having to take out a tiny stick from the back of the phone. Perhaps it is trying to target an audience of die-hard PDA fans who are so used to the stylus that they are unwilling to consider a phone that doesn't have it. 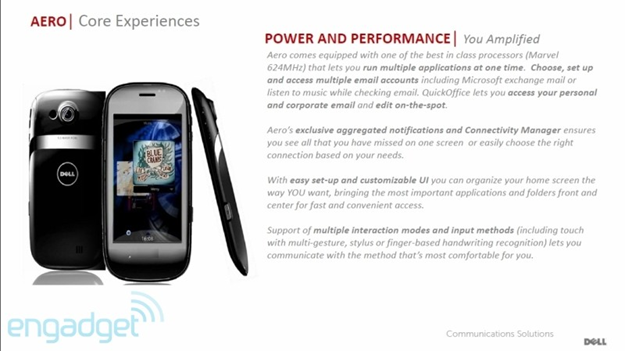 There is not much else to say about the Aero - everything else is standard Android stuff - Twitter and Facebook integration, Google contacts sync with the cloud, and running multiple applications at the same time. No word on pricing yet but I wouldn't expect the Aero to cost more than $50-80 if purchased with a contract. 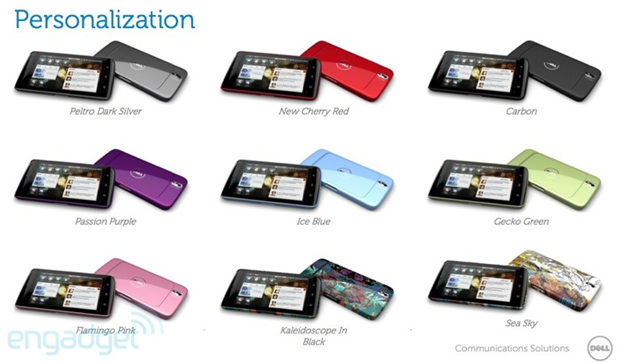 A few more details about the Streak, which is a 5" Dell tablet running Android, were leaked as well. 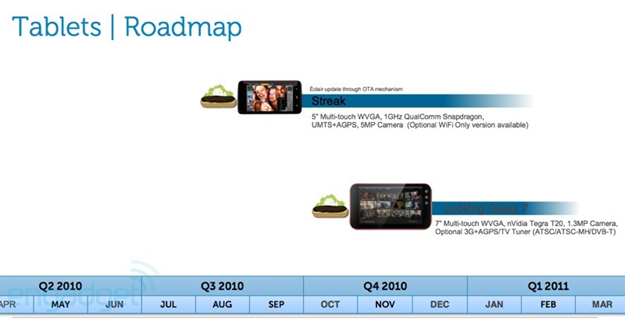 The Streak will be launching with Android 1.6 (Donut) sometime in Q3 of 2010, and while there is no definite date, it looks like August is the most likely launch month, and by September we should be seeing an Android 2.1 (Eclair) over-the-air upgrade go live. 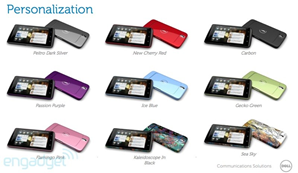 If Android doesn't already make the tablet unique enough, you will be glad to find out that the Streak will come with a variety of accessories, such as the backplates, to make it even more unique to you. Hit up the slides below for more info. 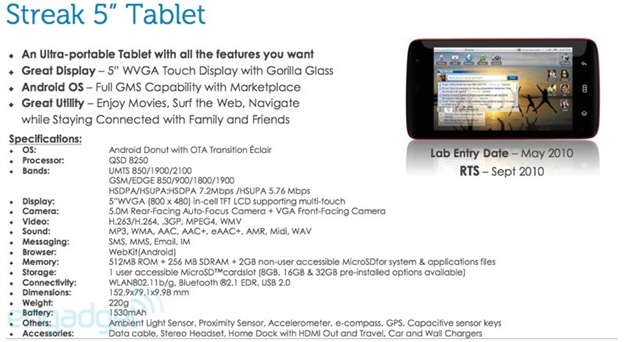 The tablet will also come with a home dock that allows for TV-out via HDMI.